It's not something you'd expect from a highway safety device, but motorists may be at risk of flying headlight reflectors. NBC 5's Chris Coffey reports. It's not something you'd expect from a highway safety device, but motorists may be at risk of flying headlight reflectors. 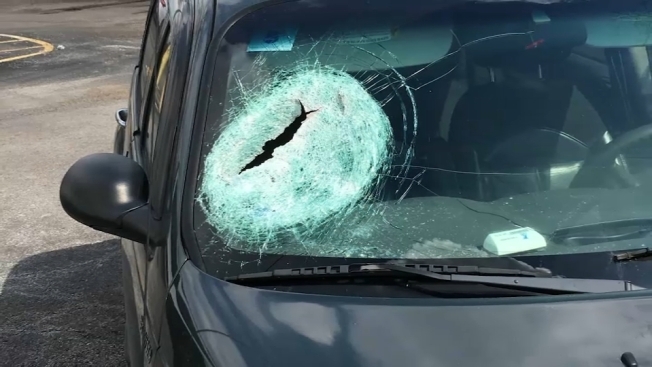 Lia wrote to NBC 5 saying that her father was heading toward Chicago on I-290 on Monday when a metal object smashed through his car's windshield. Lia said her father could have been seriously injured or even killed. The metal is used to hold headlight reflectors in place on roads. "I'm concerned and terrified about driving now,” Lia wrote. “You don't realize how these reflectors are down most streets until this happens." In fact, NBC 5 Investigates first reported on this topic in 2014 after driver Scott Hoffman said a similar metal device came crashing through his windshield. “This would have killed me. It's got sharp edges. It's a three pound piece of steel,” Hoffman told NBC 5 Investigates. More than 1.3 million of the safety devices are installed across the state. NBC 5 Investigates learned how harsh winters followed by weather changes can weaken the metal. Experts also said vehicles like snow plows and 18 wheelers can sometimes kick up the metal into other cars. The Illinois Department of Transportation said it has successfully used raised pavement markers for close to 40 years on state routes as preventative safety measures. Drivers can submit claims IDOT for any damage occurring on highways under state jurisdiction. The Illinois Tollway said it has also used raised pavement markers on its roadways as a safety measure to help delineate lanes for drivers, particularly during storms and severe weather. “The Tollway’s road operations staff conducts daily roadway inspections, which include monitoring the condition of any raised pavement markers,” said Illinois Tollway spokesperson Daniel Rozek. “Any loose or damaged markers are removed and repairs to the pavement are made as necessary.